To craft a design that the user will love, you should create the illusion that the user isn’t interacting with a device. Interface should be ‘invisible’, offering users portals through which they can interact directly with the tasks they want to complete. The less they notice using controls, the more effective their interaction with the design will be. UI is letting users find their way about the interface intuitively. Always remember about comfort and low cognitive loads! Make elements such as buttons and other UI design elements perform predictably. Form should follow function. Maintain high discoverability. Clearly label icons and include well-indicated affordances. Keep interfaces simple and create an ‘invisible’ feel. Every element must serve a purpose. Alignment – minimize your number of alignment lines. Typically choose edge (over center) alignment. Color, brightness and contrast. Avoid including colors or buttons excessively. Text via font sizes, bold type/weighting, italics, capitals and distance between letters. Users should pick up meanings just by scanning. Minimize the number of actions for performing tasks but focus on one chief function per page. Guide users by indicating preferred actions. Ease complex tasks by using progressive disclosure. Put controls near objects users want to control. Keep users informed with system responses/actions with feedback. Consider defaults to reduce user burdens (e.g., pre-fill forms). Use reusable design patterns to guide behavior regarding navigation and search functions. Concentrate on maintaining brand consistency. 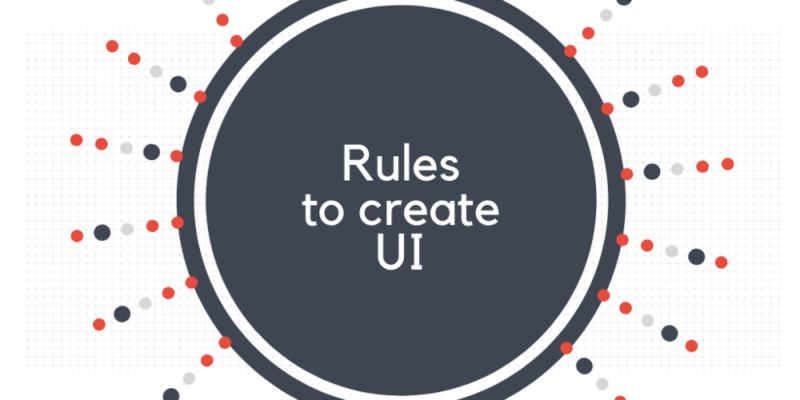 More about UI and UX, web and mobile application design, design tools and techniques can be found in our comprehensive UI/UX design guide.